* Two years of "limbo" after the Reds moved out in June 1970. ** Backstop distance of 73 feet is my own estimate; see the second paragraph below. BEEN THERE: I saw Crosley Field as my family drove through Cincinnati during a vacation trip in July 1969, and stopped at the site where it once stood in August 2009 and August 2017; see photos below. Crosley Field was a cozy little ballpark with a number of quaint and amusing features. It was most famed for the outfield slope that served the purpose of a warning track, but often gave visiting team left fielders the fits. Babe Ruth once tripped out there during his final season, and left the field in disgust. (This was the inspiration for the slope in center field at Minute Maid Park, removed after the 2016 season.) In 1935 that slope was extended along the center field fence all the way to the right field corner, thereby reducing the effective height of the fence on that side of the field. Crosley Field stood out from all the rest in two other ways: it was the first major league ballpark to install lights for night games; this was done in 1935. On the other hand, it was the last of the classical era ballparks (early 20th Century) in which the upper deck was extended from the infield down to the foul lines; this was done in 1939. Getting solid data on the dimensions during the early years at Crosley Field is difficult. Some confusion may have arisen because the builders apparently made a last-minute change in plans when it was realized that the right field corner would have been out of view to fans sitting in the rear corner of the bleachers. To rectify that, they made the diamond oriented about 2-3 degrees counterclockwise from the plan so that the right foul pole coincided with the corner of the big "L"-shaped wall. As a result, the actual distance to left field was about 352 feet rather than 360 feet. An artist's rendering of the ballpark shows the pavilion extending straight down along the first base side, but it ended up being angled inward by about five degrees, to better fit the counter-clockwise shift of the field. My estimate of the right field line in 1912 is about 390 feet, ten feet less than in the book Green Cathedrals, and the backstop distance was about 80 feet, definitely not 38. Home plate was moved forward by about twenty feet in both 1927 and in 1938, and the diamond was rotated slightly in a clockwise direction in 1927 and (probably) 1938. These changes reduced the distance to center field from 420 feet to 387 feet, the shortest in the majors other than Ebbets Field in its latter years. (The slight shift to the right in home plate resulted in an imbalance in foul territory on the two sides, like at Forbes Field.) There are a few other inconsistencies in outfield dimensions. As far as I can tell, from 1938 on, it was 383 feet to straightaway center field, and either 387 or 390 feet to the far corner of the bleachers. (Nothing changed physically, and unless home plate moved, I assume that one of those numbers is simply a measurement error. The flagpole used to be in that corner, which happened to be the object of many controversial calls by the umpire, because balls hitting the wall to the right of the vertical line painted from where the bleachers intersected with the center field wall were declared home runs. A similar situation exists in center field at Fenway Park, and sometimes you just can't be sure. From 1942 to mid-1950, and from 1953 to 1957, the right field fence at Crosley Field was brought in by 24 feet, creating a small (sloped) picnic area in front of the bleachers. In some years, that area was filled with temporary bleachers. CINEMA: Crosley Field made at brief appearance near the end of the movie Comrade X (1940) starring Clark Gable and Hedy Lamarr; the Dodgers were supposedly "killing" the Reds. Located in a warehouse district not far from the river, Crosley Field suffered devastating floods in 1913, just a year after it was built, and in January 1937. On the latter occasion, the flood waters rose 21 feet above the field, and it was a miracle that they were able to get the place ready to play ball in time for spring. After the outfield distances were reduced in 1938, Crosley Field became a hitter's park, except for pull-hitting lefties, who had to deal with a long 366-foot right field foul line. In some years after the new straight backstop was built in 1938, extra seats were added in the empty space behind home plate, creating a straight line backstop rather than a curved arc. I estimate that the backstop distance was about 73 feet from 1938 forward, not 66 feet (1943) or 78 feet (1953), as indicated by Green Cathedrals. In 1957, a new, much bigger scoreboard was installed: 58 feet tall and 65 feet wide. In 1959, high-power fans were installed to keep fans cool, and 738 box seats were added near the left and right field corners. There was a 14-foot high wall from left field extending across center field, plus four or so feet of slope, but these were not enough of a barrier to to stop home runs from landing on Western Avenue, which lay immediately behind that wall. In fact, once a home run landed in the back of a pickup truck passing by, and the ball was not found until the truck had driven many miles away! When construction began on Interstate 75 (which runs alongside Western Avenue) in 1963, they added an extra ten feet of plywood fence in hopes of reducing noise (and the number of home runs), and perhaps avoiding massive traffic accidents there. (It was about 460 feet from home plate to I-75.) For the first two years that vertical extension was out of play, so that balls hitting the plywood were considered home runs. But after some heated arguments, they decided that balls had to go over the fence to qualify as a home run. In 1965, a glass backstop behind home plate was installed, improving visibility for box seat patrons, but making it harder to hear the action. For most of their history the Cincinnati Reds were a second-tier team, winning the World Series only in 1919 (against the Chicago "Black Sox" who threw the Series for bribes) and in 1940. To handle to big crowds, in October 1919 they built temporary bleachers over York Street behind the left field wall, and in October 1940 they added a small bleacher section on the slope in the left field corner, shown in the 1938 diagram above. In the 1960s, the Reds finally became a regular strong contender, helped by the batting and fielding excellence of Pete Rose and Johnny Bench. If the Reds had not traded Hall-of-Fame slugger Frank Robinson (the new manager of the Montreal Expos) to the Orioles, they might have won the World Series even earlier than they actually did. Not until they finally abandoned old run-down Crosley Field in June 1970 did the "Big Red Machine" really get going. The Beatles played at Crosley Field on August 20, 1966, and box seat tickets for the event cost only $5.50! 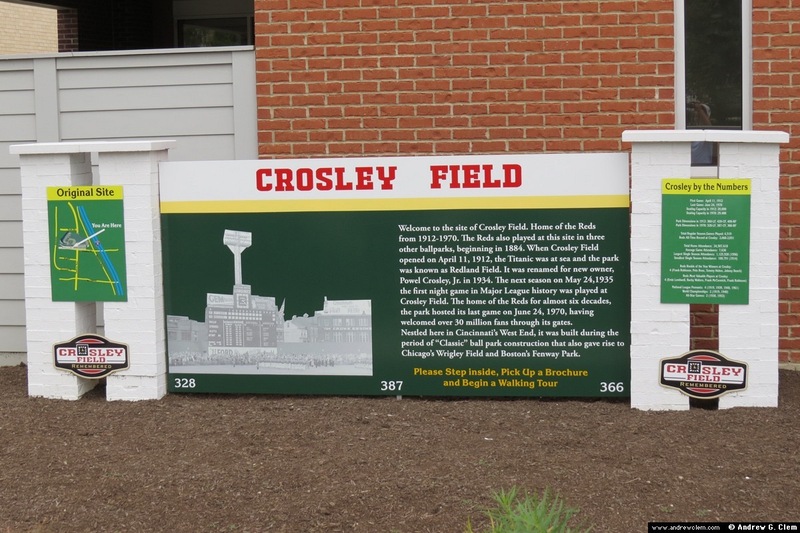 The historical site of Crosley Field is just west of Interstate 75, between York Street, Western Avenue, and Findlay Street. Dalton Avenue now cuts across what used to be the outfield, and today the City Gospel Mission occpies land near the former first base. The address of the adjacent Phillips Supply Company is "One Crosley Field Drive," or 1230 Findlay St.